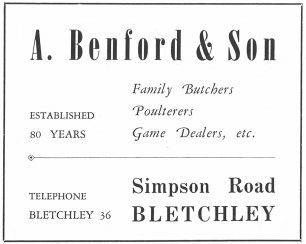 In about 1955 I started working as a butcher boy for Mr Benford in Simpson Road, Bletchley. Every Saturday morning I started at 8-30 a.m. and worked until 1-00 p.m. My round covered Fenny Stratford, Water Eaton and Bletchley. I used a bicycle with a small wheel at the front underneath the large basket. The joints of meat were prepared ready for delivery on my first round when I arrived. In between deliveries I would mince beef on a machine in a room behind the shop. 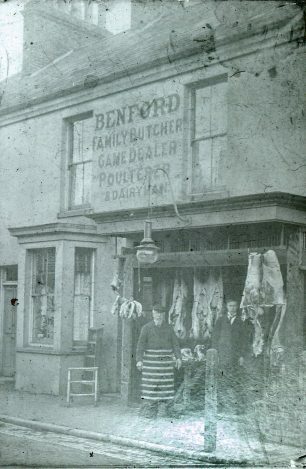 Another of my jobs was to tie string round the joints of meat after Mr Benford had boned them. Sometimes I would be sent down the road to Rowlands timber yard to collect a bag of sawdust for the shop floor. I enjoyed my time as a butcher boy, I got used to earning a wage (10 shillings a week) and the discipline of working regularly and keeping to a strict routine. Just to verify, Miss Benford was our teacher, and Tony Slater, my class mate, who after all these years have just got back in touch with, and yes, I remember both of us going up to the house, and cleaning out the stables for her, lovely lady, best R.E. Teacher i had, John Lloyd. 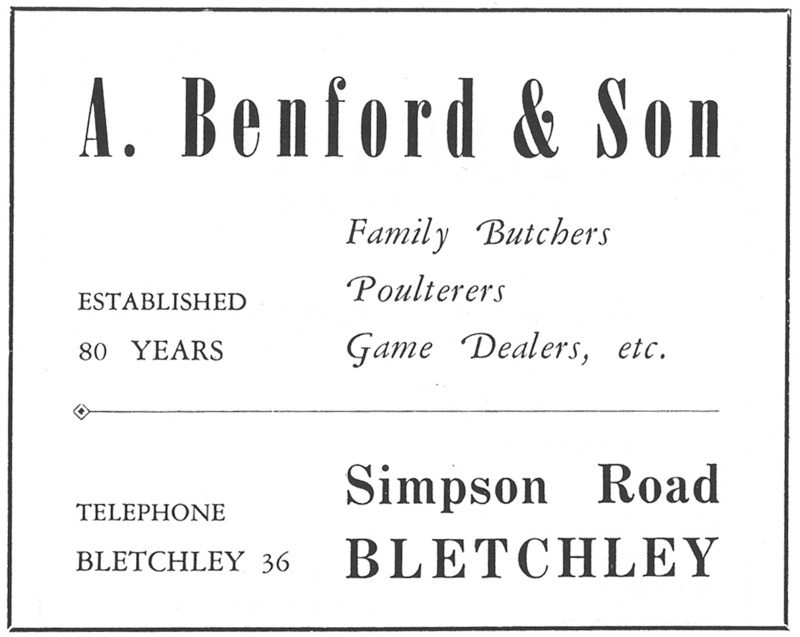 Miss Benford was Benford the Butchers daughter. She taught me in my first year at Leon. I went on to be a butcher’s boy for the co op in Victoria Rd. Sit up and beg bike with a big basket. 10 bob a week and sometimes a little liver for free ! Yes is the answer to your question re Miss Benson (RE Teacher), myself and a friend used to go to her family home most weekends in 1971/2. 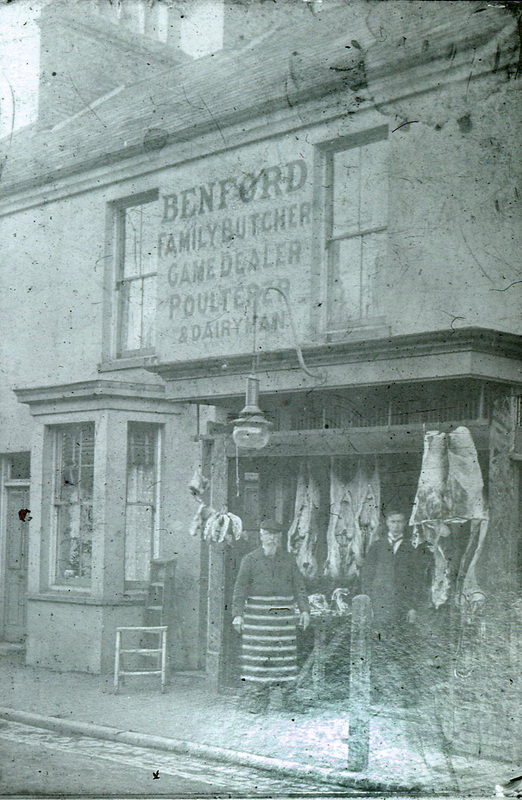 I can remember as a child we lived in Simpson and I used to go with my father to Benfords to get the meat. If we were lucky we did not get held up by the train at the level crossing and then we used to go inside and choose the meat for the Sunday dinner. I used to get told off for swirling my feet in that sawdust and when they took a long time chatting could really make an interesting landscape in it!